"Toyota Indonesia has a close partnership with local suppliers, to grow together and improve quality ⎯in order to meet customer needs. This partnership is dedicated to develop suppliers through the transfer of expertise, that prioritizes the development of reliable human resources with global level skills, in welcoming the era of industrial revolution 4.0. TMMIN also embraces the 1st layer suppliers to transfer this knowledge to their suppliers, so that the domino effect can take hold. Hopefully, together we can contribute to improve the competitiveness of the Indonesian automotive industry, so that it can be the best choice for domestic consumers and in the export market," said TMMIN Vice President Director Edward Otto Kanter. The term Jishuken is taken from 2 Japanese words, namely Jishu and Kenkyu, which means self-independent investigation or the ability to conduct problem investigations and make plans, as well as improvement activities independently. Jishuken itself is a form of training to guarantee the transfer of skills and improvement in the quality of Human Resources (HR) carried out by Toyota, to all local suppliers in Indonesia, particularly regarding the implementation of the Toyota production system (TPS). TPS Jishuken activities were first introduced in 2007, and until the 11th implementation, the activities have carried out TPS introduction activities and the development of 18 TPS Leaders from 17 1st tier local supplier companies, who will also carry out wider transmission of TPS concepts in their respective companies and in the 2nd tier local supplier companies. In the future, it is expected that as many as 40 1st tier local supplier companies will be actively involved in the TPS Jishuken program, to create 40 TPS Leaders. "We always close the TPS Jishuken activity with sharing session, so that we can learn from each other and implement best practices, and continuously ignite the passion for developing and creating breakthroughs and innovations," Edward added. 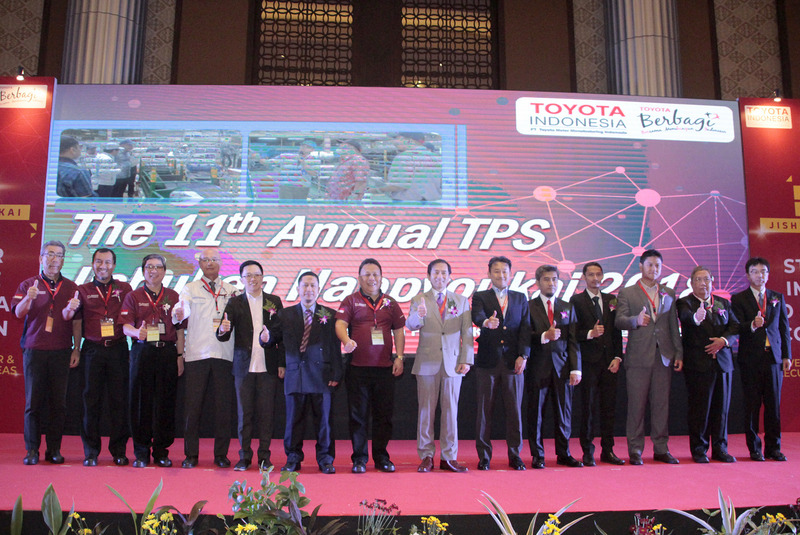 As part of Toyota Indonesia's commitment to contribute to the development of the automotive industry in Indonesia, TMMIN encourages 1st tier local suppliers who have Toyota's standard instructors to transmit the insight to the next tier suppliers that cannot be reached directly by TMMIN's business operations. So that in 2014, at the initiative of Indonesian Automotive Industrial People Development (IAIPD), which was the association for TMMIN's 1st automotive supply chain companies, the "Tier-2 Trainer Development" program was launched under the mandate of the Indonesian Automotive Institute (IOI). In last July, IAIPD completed the 3rd cycle of the program aimed at developing human resource capabilities in the field of Production Management in 2nd automotive supply chain companies. In this program, IAIPD, transmits the knowledge and experience they received from TMMIN by training their instructors according to Toyota's standards in Indonesia. A total of 37 new instructors with "Trainer" title from the 2nd tier automotive company received a Certificate from IAIPD.